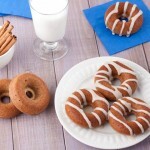 Gluten-free chai spiced doughnuts with no sugar added almond frosting. 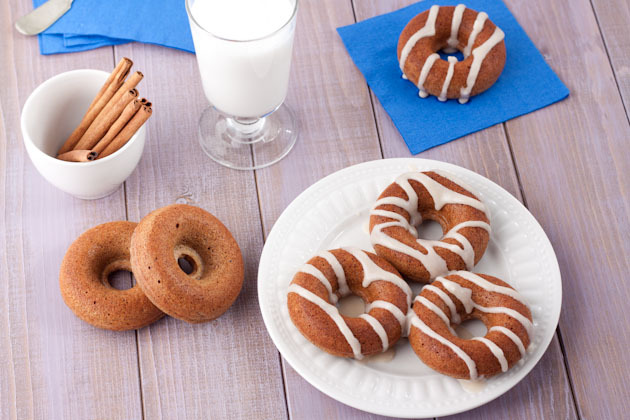 They’re sweet, delicious, and under 180 calories! Preheat oven to 375F and set out your normal-sized doughnut pan. Fill each cavity ¾ to the top. Be careful not to overfill or the doughnuts will overflow while cooking and look more like bundt cakes than doughnuts. Place in the oven to bake for 16-20 minutes, or until toothpick inserted comes out clean and edges are just beginning to brown. Mine were perfect at 17 minutes. Meanwhile, combine all frosting ingredients in a small bowl. Whisk until combined. If too liquidy, place in the fridge for a couple of minutes to allow the coconut butter to harden slightly. Remove from oven and allow to cool for 1-2 minutes before grabbing the pan with an oven mitt and tipping over onto a cooling rack. Allow to cool completely (about 30 minutes) before adding almond frosting. If you don’t have a doughnut pan, no worries! This mix can be can be made into 24 mini muffins too. Bake for about 15 minutes at the same temperature.